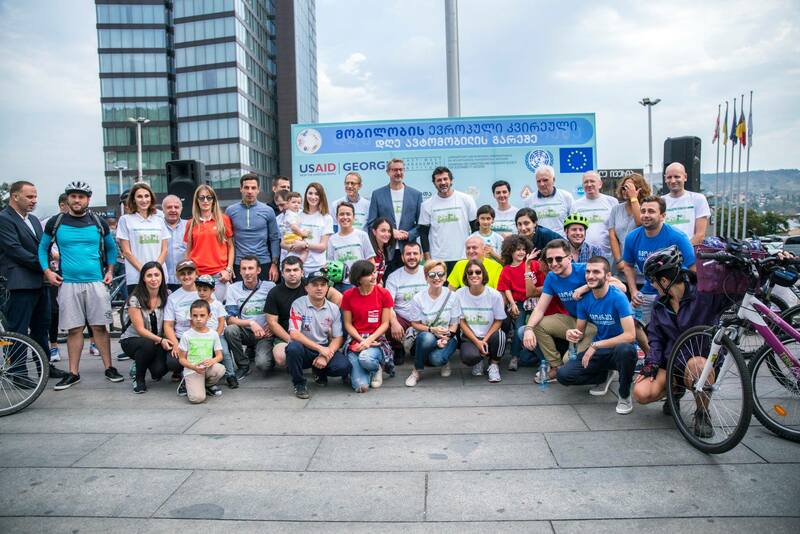 On September 22, within the framework of European Mobility Week, the Georgia Alliance for Safe Roads organization, with the support of The Advancing CSO Capacities and Engaging Society for Sustainability project (ACCESS) of East-West Management Institute and with financial support of United States Agency for International Development (USAID), organized a symbolic cycling race. Cycling race took off nearby Vake Park and finished at First Republic Square. By the end of the race, the public officials gave speeches to the event participants. International Car Free Day that was initiated by the European Commission launched in 2000 and it is celebrated in Europe and many counties of the world ever since. International date aims to reduce the number of single private vehicles in central areas in order to protect the environment, as well as to popularize public transport, bicycle and walking. The main proposition of the day – citizens to stop using private vehicles for a day, but walk or use alternative and healthy transport – bicycle, public transport or walk.